BotF managed to breast the yuletide season finishing line tape – just – with a couple of new beers under a Christmas tree. 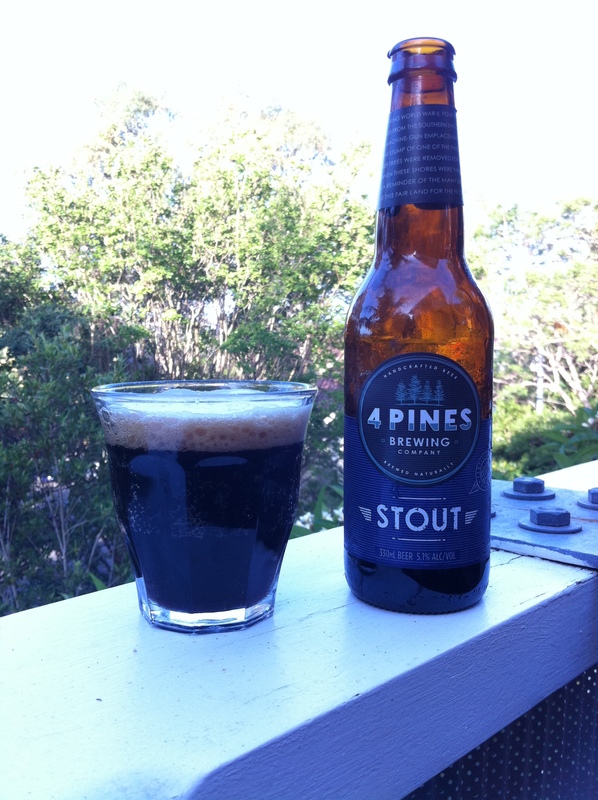 First up was the 3rd of the 4 bottled beers available from one of BotF’s favourite brewers and bars – 4 Pines at Manly. This BotF correspondent has professed his love of dark brews many times, and this offering from 4 Pines only stokes those amourous flames. Dry, roasted, great long lasting bitterness – this is a great Australian stout. 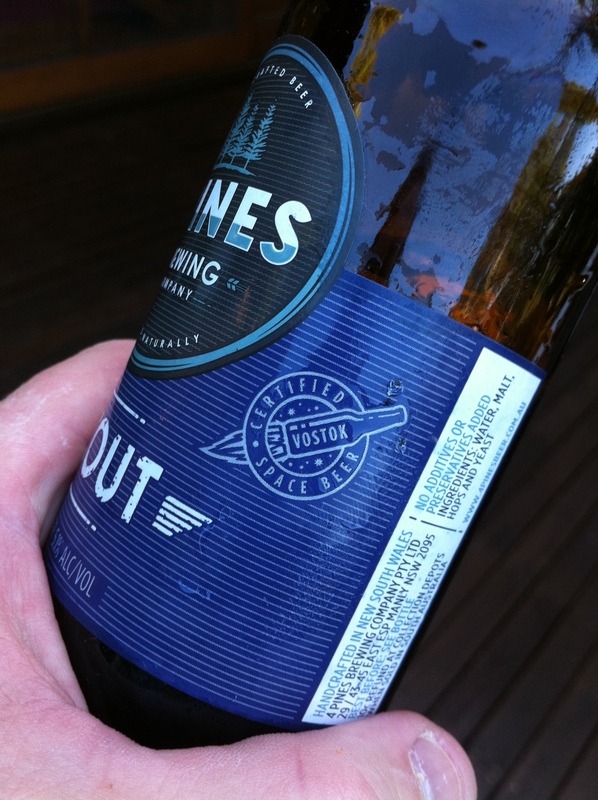 On the label is an interesting little designation “Vostok – Certified Space Beer”. Rather than do an Alan Ramsey an re-type a whole article, read the hotlinked story from the SMH or this one from the Manly Daily about what this all means. Beer hyperbole gone mad – or fair dinkum – your call. Second beer under the Christmas tree for the evening was a British beauty. 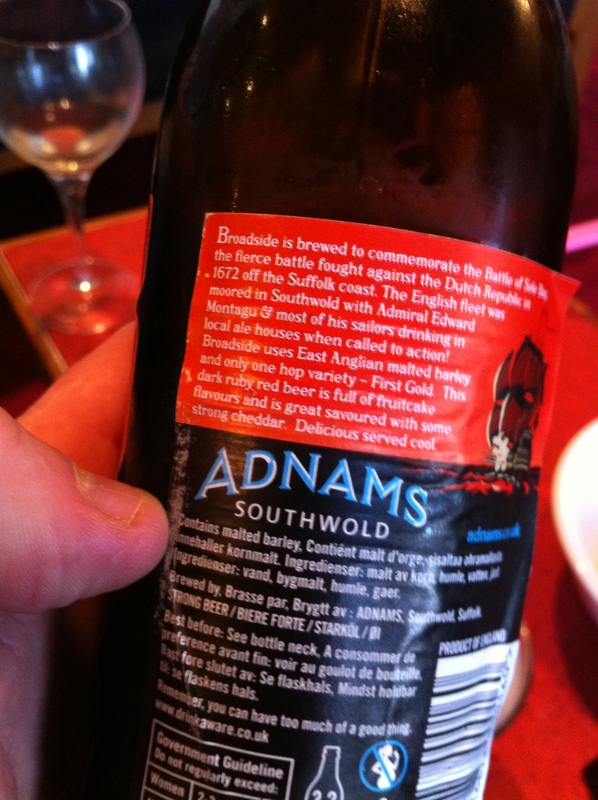 Adnams Southwold is a brewer from the East Coast of England. Founded in 1872, it is really starting to expand in the UK as well as enter the export market. They’ve recently expanded into the wine, spirits and hotel market. 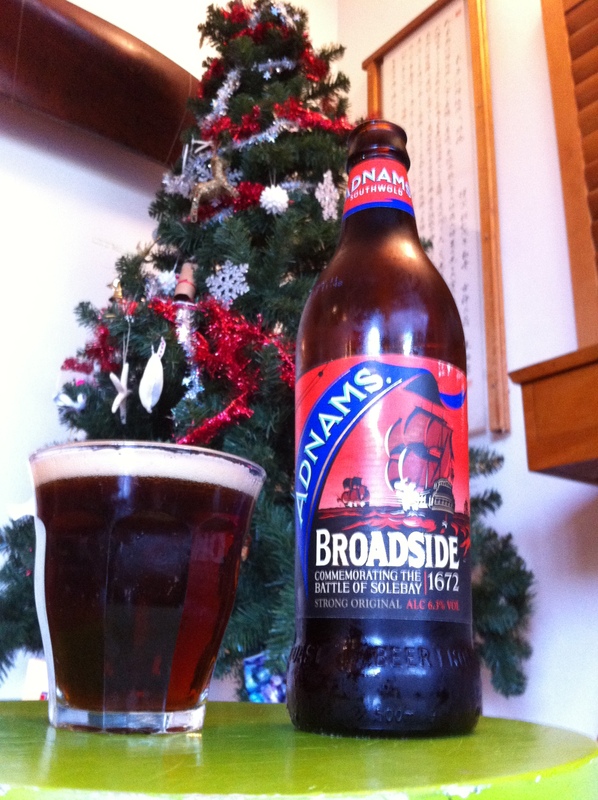 If the rest of their product is good as this 500ml bottle of Broadside, then there could be worse places to live than Southwold. This is a wonderfully rich, complex ruby beer. They use it to make Christmas pud, and you wouldn’t want too many pieces as you’ll be falling into your brandy sauce. At 6.3% alcohol it is significantly stronger than the on tap version. Maybe it was the release of finishing up for the year, or the alcohol content – but after draining this awesome beer, sleep was the only option. There’s plenty of variety in the Adnams stable and BotF looks forward to trying them. The beer commemorates a famous sea battle that was held in 1672 off the coast of Southwold. The Battle of Solebay was between the Dutch and the Poms/French. Apparently an exciting draw, with two further fixtures played – the next one being nearer Holland.